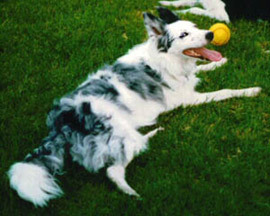 Deaf dog: Misty, a blue merle Border Collie born deaf. Her motto? "Being deaf doesn't mean you can't be alpha." Misty has her own web page. Other pets: Burton, Katie, Scout, and Cherokee. Deaf dog: Duncan, a bi-color Border Collie, lost his hearing at eight months as a reaction to antibiotics. 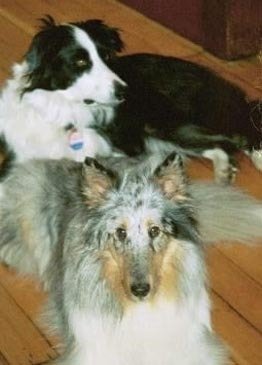 Other pets: Tasha the fox terrorist; Jordi, the All-American boy; Spunky, a blue merle Sheltie. Deaf dog: Diz, an Australian Shepherd. 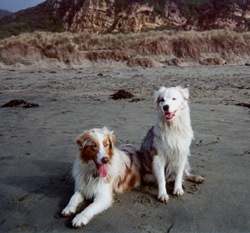 Other pets: Shayneh, a red merle Australian Shepherd. Deaf dog: Callie, a seven year old Dalmatian born deaf (she is still often mistaken for a puppy because of her usually happy and outgoing demeanor). She is firmly convinced that all people were put on this earth to pet her and she is always happy to help them in their appointed task. She's still not fond of cats, but she has many human and canine admirers at the local dogpark. She is also extremely intelligent and clearly has visual acuity that makes up for the lack of hearing. This is especially convenient for spotting unexpected snacks. Most important, she is easily the most affectionate dog her mom has ever had, happiest when some part of her is touching some part of you. Despite her occasional prima-donna-from-hell ways, Callie is devoted to Rex, the older dog, and each of them has brought out the best in the other. Other pets: Rex, a 10 year old Lab/Border Collie mix; Eugene, cat, who has now passed on. Deaf dog: Wilbur is a 3 year old White Boxer. He is a great dog. Even though he is deaf, it is not a problem. He is just like any other "hearing" dog. Except he sleeps a lot more soundly. Deaf dog: Lita, also known as Princess of Everything Crazy Monster #1 and Lulu, also known as Crazy Monster Lulu Dallas #2 are both all white with blue markings and blue eyes. They were born on November 7, 2000. These two Pit Bulls are from the same mom and dad and we did not realize that we picked the two only deaf dogs out of the litter until about a month after we had them. For the first year they were a hand full, so we enrolled them into Loyal Dog Partners dog training and every week for about two months now they have been drastically improving on their behavior. Lita is a very fun loving dog who loves to play tug-of-war, give kisses, and eat a lot more than her sister. Lulu loves to chase after birds, obey a little bit more than Lita ( Lita is still getting the hang of our hand signals), lay in the sun and cuddle in your lap. We think Lulu is the runt of the litter because she is about eight pounds smaller than Lita. My sister Jolie and I tell ourselves that we were destined to raise these two amazing dogs. Deaf dog: Dallas is a 2 year old Australian Cattle Dog. "Dallas came to me through my Rescue. I fell so in love with her, we decided to adopt her. Dallas is the joy of our life. She is so smart and loving. She loves to go to the parks to hike and swim. Dallas always keeps me in sight when we are out. She is very well mannered and has a huge heart. No fear in this gal!" Human companions: Lorice Akers, her husband, 2 children and 4 grandchildren. 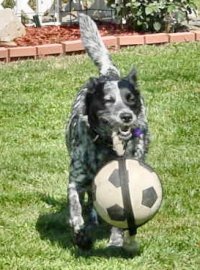 Other pets: Dixie, 6 month hearing Australian Cattle Dog; and Eclispe, 13 yr. Lab. Deaf dog: Zoia joined our family in 2001. She belonged to a trainer who trains and breeds Schutzhund German Shepherds. She was not Schutzhund material because she refused to bite! (not a bad thing in our opinion)She is the mama to several litters of champions, but needed a new home because she did not have a "job" anymore and her owner did not want her to live in a kennel all day. Zoia had never been around children much, but she proved to be superb with our brood! Zoia has had chronic ear problems since she was very young, and no amount of vet care really helped long term. We noticed she went deaf over the last year. She is totally deaf now, but she is still the greatest dog ever. We love her very, very much and hope she has many more years left with us. Human companions: Frank, Anna, and 5 kids! 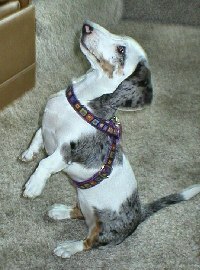 Deaf dog: Foxxy Doxxy is a Dachshund. "This little ball of bubbles is 6 months old and is knocking them over. We live and travel in a Motorhome. When we take Foxxy for a walk she has to stop and talk to everybody - like they only came to see her. This would be fine and good in a normal neighborhood but ours changes every weekend - so we have to stop 4 - 6 times to let everybody ooohh and aaah over her (and redo it every weekend). I have even tried taking her out and walk next to the street but I have had cars stop to look at her. Our little queen of bubbles." 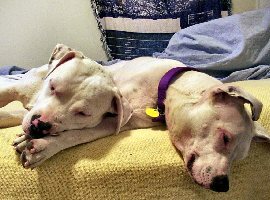 Deaf dogs: Audio is a 1-1/2 year old Pit Bull/Dalmatian mix. Deaf dog: Emmitt is a 3 year old Boxer. "I rescued Emmitt from the local animal shelter. They were concerned no one would take him because of his deafness. He has been one of the best animals I have ever owned. He is a white Boxer with a blue eye. 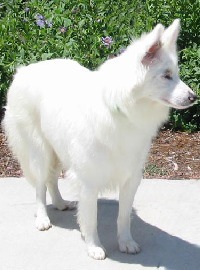 He is quick to learn hand signals, and reads body language well, and minds better than my wife (who can hear) :)"
Deaf dog: Cailida is a 1 year old American Eskimo mix. "Cailida is a special girl, she is loving and eager to please. She also has the most acute sense of sight. She has the ability to watch and imitate what she sees perfectly, so much so that neither the people we got her from nor the vet who looked after her were cognizant of the fact that she was deaf. She is also a royal beauty!"